In the late afternoon, we had appointments for full-body aromatherapy massages. 75 minutes of intensive massage felt like 15 minutes! It was so good that I dozed a few times during the session. It was already our last evening in Seoul in this trip. 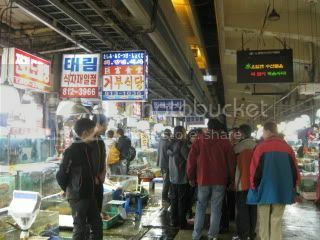 For our final evening, we took a subway down to Noryangjin to visit Noryangjin Fisheries Wholesale Market. 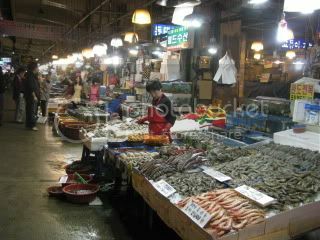 The market was only a few minutes walk from the station. 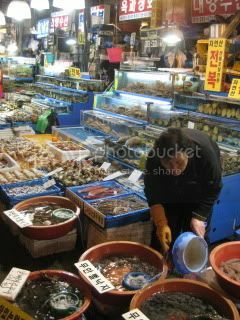 My jaw dropped when I came down the stairs to see the huge market with dozens and dozens of seafood vendors…it was such a dynamic view! 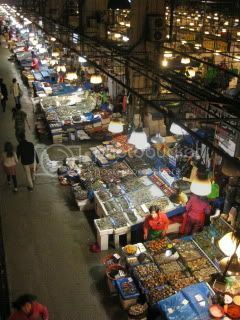 There are about 700 vendors and 3,500 people work in this gigantic space. 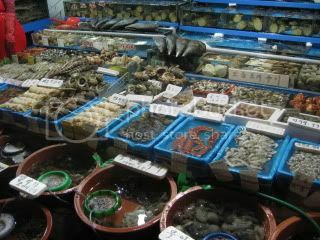 We started walking and got so excited to see so many fresh live seafood everywhere. 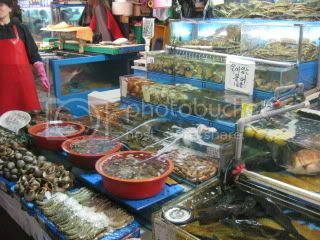 It seemed few tourists come to this market, so it was hard to find vendors who can talk either Japanese or English. This market is open for both wholesale and public. 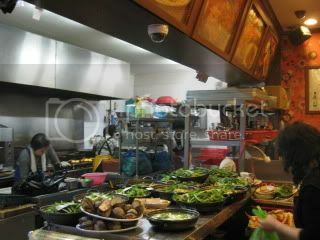 There are also restaurants inside, where you can take your purchases and have them cooked to dine there. 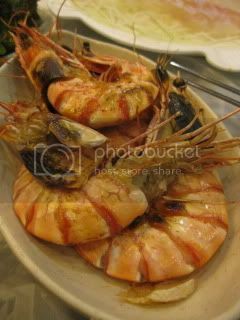 So, we wanted to by different kinds of seafood to take to a restaurant. 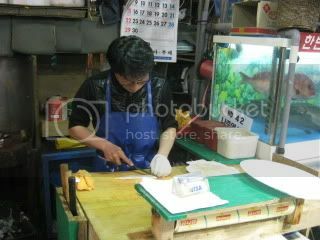 From one vendor, we found a small-size live hirame fish, so we bought it and asked to make it into sashimi (the whole fish was only 20,000 won – about $18!). 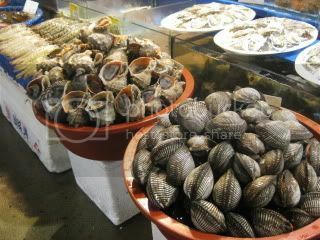 From another vendor just across from him, we also picked up jumbo shrimp, abalone, and clams (all alive, too). 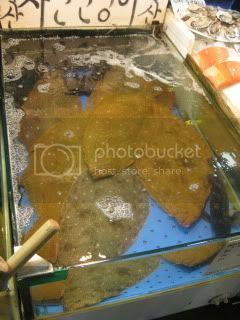 But, we were not brave-enough to pick up these guys… So, later I found out these unique-looking creatures are called “gaebul” in Korean, and they are a type of warms live in the ocean or in the sand. 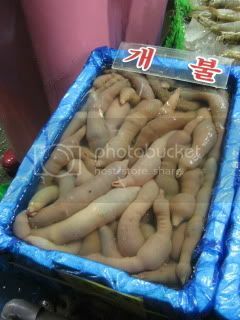 The translation of “gaebul” is “dog testicle”! No wonder, why those vendors were giggling when I asked them what they were. 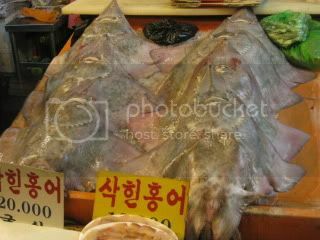 Korean people normally slice it and serve sashimi-style with kochujang. Next time, if someone serves me, I would like to try. Our purchases were handed to an employee of a restaurant just by those vendors, and we were taken to the restaurant. We were not sure of all the rules/ procedures, so we just let ourselves follow the flow of whatever happened! Just upstairs of the market outside, there was the restaurant. It looked quite from outside. 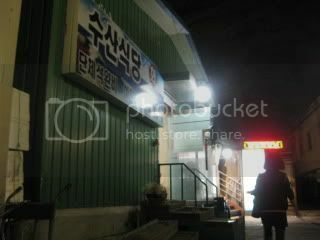 But, once we entered, the restaurant was packed with all the people and it was so noisy! Wow, this place was so lively. 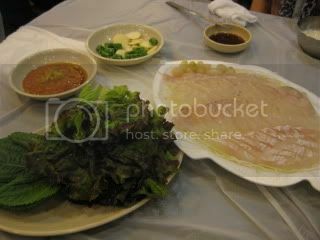 We ordered a bottle of makgeolli, and started our sashimi appetizer. 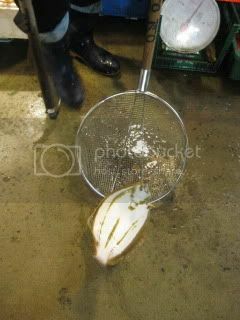 It was obviously so fresh and pure…the fish was alive just several minutes ago! 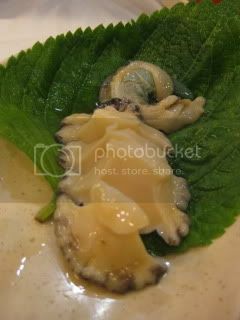 Abalone was served sashimi-style, too (with its guts). 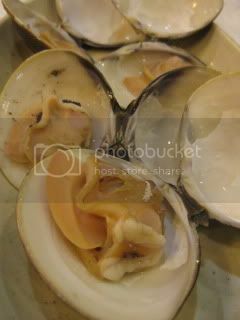 Shrimp was grilled with salt, and the clams were boiled, although I tried to ask our waiter to use the clams in jjigae. They all tasted great! 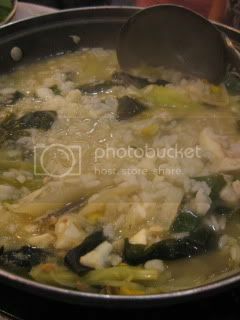 With the carcasses of the hirame, jjigae hot pot was made and brought to the table. We started cooking it on the over-used beaten-up table-top burner. How fun! 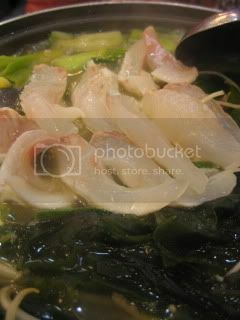 Since we still had a good amount of leftover hirame sashimi, we added them to the hot pot, too. Woooow…deep amazing flavor! 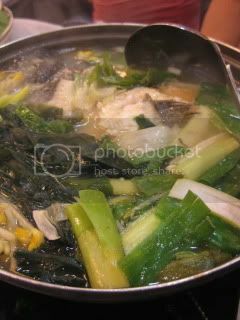 We were just moaning over this rich broth. 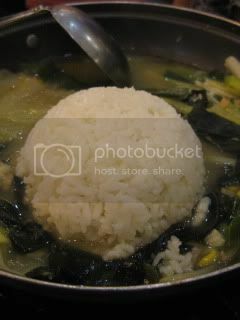 To finish, we ordered a bowl of rice and made our own “shime” ojiya (soupy risotto). We moaned even deeper…so good. 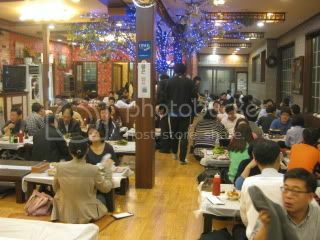 For the entire evening, the restaurant remained to be super busy and loud. Everybody looked so happy and also drunk! 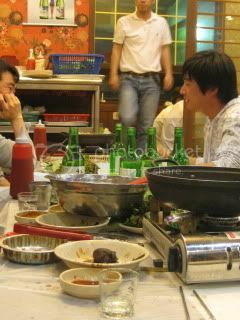 Korean people love to drink…many empty soju bottles at every table. My kind of people. We saw no non-Asian people in the entire night, and also it seemed like we were the only tourists in the entire restaurant or the market. 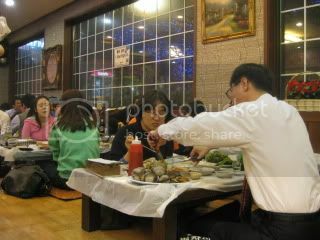 All the others looked to be local Korean people. So it was definitely an adventurous night for us to put ourselves in such a hard-core local place. We loved it so much and we definitely want to come back here next time.